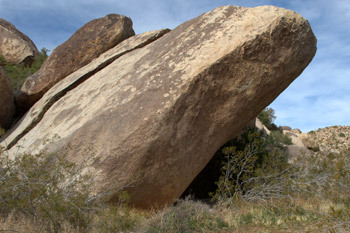 Adjacent to an old trail connecting Little Blair Valley with Smuggler Canyon is a large granite boulder that serves as one of the few well marked and easy to get to pictograph sites in Anza-Borrego Desert State Park. 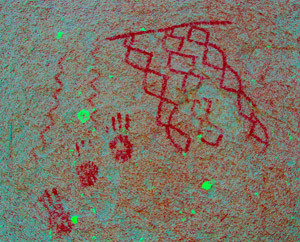 Numerous images, painted in red and yellow roughly 200 to 1000 years ago, lend their continued magic to the sides of this rock. Due to the preponderance of the use of red pigments, along with traditional diamond chains and zigzag lines, it’s assumed that this site played an important role in Kumeyaay initiation ceremonies where young girls entered the ranks of womanhood. Both the designs and color used to paint them had great importance to the Kumeyaay. Red was the traditional color to denote the arrival of menstruation and womanhood, while black was used at the site of male initiation ceremonies. The diamond chain and zigzag lines were also gender specific as it was felt that they depicted the rattlesnake, the appropriate spirit helper for a woman, and therefore these were necessary symbols to aid in acquiring such a powerful ally. In addition to the pictograph boulder, visitors to this site can also find along the trail numerous bedrock mortars, pottery fragments and lithic flakes to further remind them of the prehistoric presence here. However, this isn’t the only pictograph site to be found in the area. We’ve long heard rumors of another location, an older site that rests in solitude and obscurity, its delicate pictographs now faded with age, forgotten and unseen. We’ve hunted for it before and know of many places where it isn’t located! Today, though, dawns bright with promise and you just might want to click on the photo link below to see what turns up! Oh, enjoy the images but don’t bother asking where it is. We won’t tell you. If the site wants to be found, that’s its business. We’re keeping quiet!